HUD missing on some Zoom Poker tables? If you play on a PokerStars Zoom Poker table, and the Poker Copilot HUD isn’t appearing, even though you’ve turned on the experimental Zoom Poker HUD, then please check if the table you are playing on is listed here. # of seats: eg. 6-max, 9-max. This will help me add any missing Zoom Poker tables to Poker Copilot. 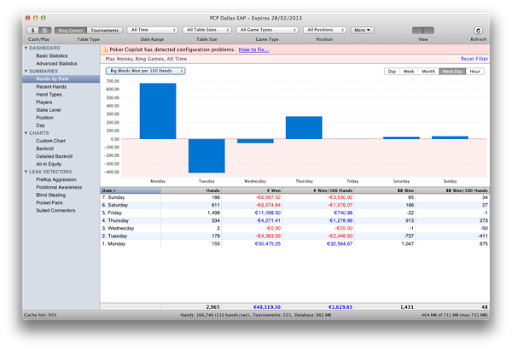 Poker Copilot 3.26 is now available to download. Recently PokerStars has started creating hand histories in some cases where spaces are missing. This prevents the hands from loading. This update detects and fixes those problems. You can read a Poker Copilot review in Portuguese here. As far as I can tell, the blog hosting the review is called “Reflections of a dog with fleas”!